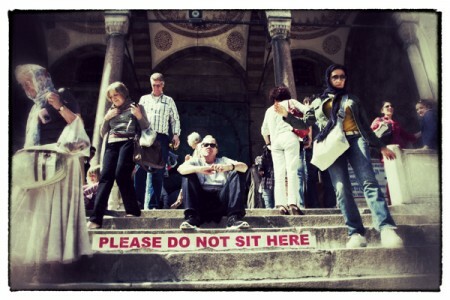 David Lansing on the steps of the Blue Mosque in Istanbul. I grew up just blocks away from Disneyland, which doubled, during the summer, as my day-care center. My parents would drop me off at the front gate at 8 every morning and pick me back up at 5. When I was 9 or 10, my father built a smaller version of the Swiss Family Robinson Treehouse, supposedly so I could sleep up there on warm summer evenings and watch the aerial fireworks over “The Happiest Place on Earth” from my bunk. Unfortunately, my dad, who wasn’t getting along so well with my mom at the time, took over the treehouse shortly after building it and turned it into his own little bachelor pad, complete with a Coleman stove and a rope ladder that he’d pull up every evening to keep the rest of us out. After a very long stint mixing drinks and waiting tables, I got a masters degree in Creative Writing, Fiction from UCI and ended up, logically enough, working for a publishing company specializing in how-to books about computers. But who wants to be known as a computer writer? So I became a ski writer. Because it seemed fun at the time. When I realized I no longer had anything new to say about Aspen or Vail, I went to work for Sunset, landing a job in the marketing department writing a newsletter for grocery store executives. My job was to call busy brand executives at General Foods and get them to explain to me the difference between Light and Low-Fat mayonnaise (I’m still confused). Eventually I was promoted to travel writer and instead of writing about mayonnaise, waxed eloquently about roller-blading, pinepeds, lighthouses, and other exciting topics. Now I write for a dozen or so different magazines, some you’d know and some neither one of us has ever heard of. The first story I ever wrote for National Geographic Traveler was picked by Bill Bryson for Best American Travel Writing 2000. That got me to Berlin, Paris, Vancouver, and a few other places until they sent me on a 10-day trip down the Colorado River to recreate John Wesley Powell’s epic 1869 expedition. I turned in that story a year late. Because I had nothing to say. One day on the river was like the next. You get up, you float, you make camp, eat, drink and go to sleep. Day after day. Suffice it to say that “nature” is not my thing. I need people. Characters (my background, remember, is as a fiction writer). I’ve won lots of awards. Some more impressive than others (my favorite is one I got from Scotland; they wanted me to wear a kilt in Edinburgh when they gave it to me). But every writer I know has won “some” award or another, so don’t be too impressed by that. I started this blog because I felt that the things that were most interesting to me in traveling were exactly the things my editors didn’t want me to write about. All those little short stories I experienced while traveling to Cuba or Malaysia or Spain ended up as unpublishable notes in a hundred different notebooks where they died a lonely death in one of my file cabinets. So sad. Having spent more time in Disneyland than I care to remember, it’s always seemed to me that the most interesting stories happen behind the scenes—not what Mickey and Minnie do while on Main Street but what they do when they disappear behind those secret doors. At least those are the stories that interest me the most. And the stories you’re most likely to read here.